NASA's OSIRIS-REx spacecraft discovers water on asteroid Bennu. Here's why that's a big deal. The discovery sheds new light on the early solar system and the origin of life on Earth. In a discovery that sheds new light on the evolution of the solar system, NASA's OSIRIS-REx space probe has detected water on Bennu, the skyscraper-size asteroid that it nestled up to last week after a two-year voyage. The discovery, made during the final leg of the probe's 1.2-billion-mile journey and announced on Monday by NASA, suggests that water was common in the early solar system. "That is important because we are still trying to understand how planets form and evolve over time," Amy Simon, a scientist at NASA's Goddard Space Flight Center in Greenbelt, Maryland, and a member of the OSIRIS-REx team, told NBC News MACH in an email. The discovery adds support to the idea that comets and ancient asteroids like Bennu could have brought water and possibly organic molecules to Earth, according to Simon. "Those components together are needed building blocks for life," she said. "It all ties together with understanding Earth's early history." A roughly diamond-shaped object about 1,600 feet in diameter, Bennu is thought to be too small ever to have contained liquid water. But pieces of water molecules known as hydroxyls were detected within the clay that makes up the boulder-strewn asteroid. 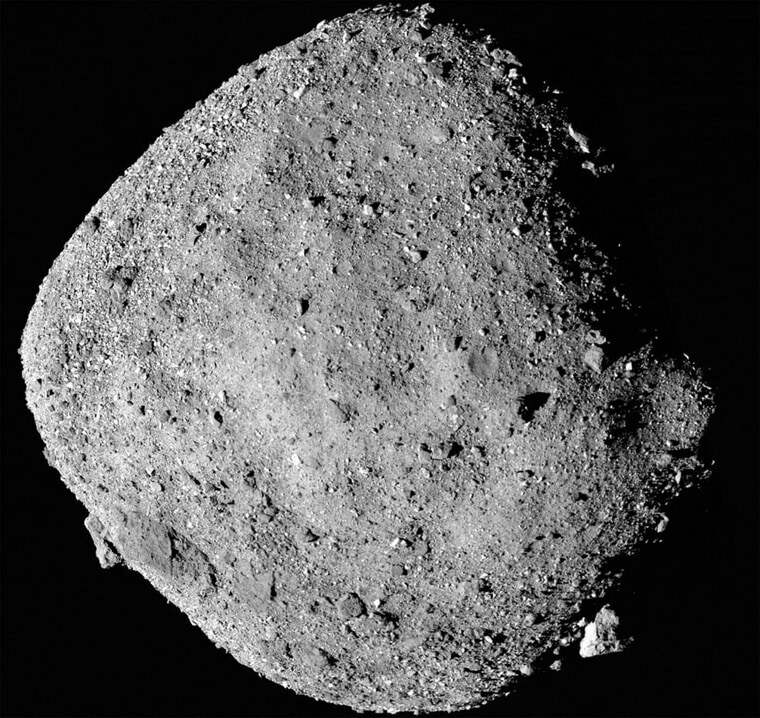 The pieces indicate that liquid water was present on the much larger asteroid that Bennu is believed to have broken away from in the distant past. The discovery was made by the probe's OSIRIS-REx Visible and Infrared Spectrometer (OVIRS) and the OSIRIS-REx Thermal Emission Spectrometer (OTES). The instruments are designed to identify chemical compounds on the basis of the wavelengths of light they reflect, and they showed the distinctive "signature" of the watery minerals on Bennu. "It is seen in every spectrum, telling us that these minerals are spread all over the surface," Simon said. OSIRIS-REx — the $800-million mission's name is an acronym for "Origins, Spectral Interpretation, Resource Identification, Security - Regloith Explorer" — launched from Florida in 2016 and arrived at Bennu on Dec. 3. Plans call for the spacecraft to spend about a year mapping the 1,600-foot-wide asteroid and then use its robotic arm to grab a tiny sample of its rocky soil (regolith) in 2020 and return it to Earth for study in 2023. The space probe is now about 9 miles from the surface of Bennu, which itself is now about 73 million miles from Earth. Bennu is classified as a "potentially hazardous" asteroid because there's a one-in-2,700-chance that it will collide with Earth in the 22nd century.